Children's Stories - How Do I Get To The Top? The biggest bananas Bobo had ever seen grew on a tree at the top of a waterfall. It wasn’t a huge waterfall that fell for hundreds of feet, but a gradual waterfall, that cascaded over steps of stone as it rushed down the hillside. At times the waterfall was nothing more than a trickle, but it had rained all night and so it was rushing faster than a hundred trains. Bobo wanted to eat one of those bananas, maybe even two, if his tummy could hold that much. His biggest problem was how he was going to get up the waterfall. He couldn’t swim very well and the water was rushing down very quickly. "I’m hungry and I want one of those bananas!" Bobo shouted. The monkey scratched his head. "I know! I’ll climb up the side of the waterfall." Several thick vines hung down from trees. "If I swing on the vines, I can make my way up to the top and have one of those delicious looking bananas." Bobo stood on his tiptoes and grabbed hold of a vine. He tugged at it to make sure it was strong. "Here I go." He swung back and forth on it. "This is fun," he giggled. The water splashed and bubbled as it ran down hill below him. He swung harder and harder and grabbed onto the next vine. "Wheeeeeee!" It wasn’t easy because he was making his way up a hill, but he was having too much fun to notice. He swung with all his might and grabbed another vine. The spray from the waterfall had dampened this one. Bobo couldn’t hold onto it and slipped. BUMP! BOOM! BUMP! BOOM! He rolled through the water, being tossed and thrown about and landed with a splash in the pool at the bottom. "Cough, cough." The monkey choked and gasped for air as the water sloshed down on him. Finally he was able to grab onto a root sticking out of the mud and pulled himself out of the water. He sat there, dripping from head to toe. "I am hungry! I want one of those bananas! I’ll have to think of a different way to get to the top of the waterfall. He scratched his head as he thought about it. "Aha! I have an idea," Bobo said. He spotted several branches that had fallen from one of the trees. "I’ll make stilts and walk up. Those steps are wide. I can do it." He spent an hour finding just the right branches. He had to make sure they had bumps sticking out to put his feet on. He took the sticks into the pool at the bottom. "Now, all I have to do is climb from step to step to the top and I’ll soon be eating a delicious banana." He climbed onto the sticks. Water rushed around him, nearly knocking him over. He moved the sticks up to the first step. "I did it! Now, for the next step." Bobo was able to climb up three of the stone steps before one of the sticks slipped. BUMP! BOOM! BUMP! BOOM! Down he went. The sticks flew threw the air and landed in the trees and Bobo ended up in the pool at the bottom of the waterfall. "Cough, cough." The monkey choked and gasped for air as the water sloshed around him. He felt under the water for the root of the tree, found it, and pulled himself onto the muddy banks. "That didn’t work either. How am I going to get to that banana tree?" He stood scratching his head, trying to think of another plan. Just then a bright red and yellow parrot landed on the branch of a tree above Bobo. "I’ve got an idea. Parrot, will you fly me up to the top of the waterfall so I can get a banana? I’m very hungry." The parrot began to squawk. "How can a small bird like me carry a big monkey like you up to the top of a waterfall? SQUAWK!" "I’ll hold onto your claws. You can flap your wings and fly up there. When you get to the top, I’ll let go and then you can fly away," Bobo explained. "We can try," the parrot said. He flapped his wings and landed on Bobo’s furry head. Bobo grabbed hold of his talons. "Hold on tight. Here we go." The parrot flapped and flapped and flapped. Bobo was very heavy but he did manage to carrying him halfway up the waterfall. "I can’t do it. You’re too heavy. You’ll break my wings. Let go right now," the parrot demanded and started trying to pull his claws out from Bobo’s grasp. Bobo had no choice but to let go. He fell through the air and landed in the waterfall. BUMP! BOOM! BUMP! BOOM! He bumped and crashed into the rocks as he was washed down to the pool at the bottom. "Cough, cough." The monkey choked and gasped for air as the water sloshed around him. He grabbed onto the root of the tree and pulled himself onto the muddy bank. SQUAWK! SQUAWK! SQUAWK! Bobo watched the parrot fly into the trees and disappear. The sky was still gray and dismal from the storm the night before. "I suppose I could try to swim or walk up the stone steps. They’re very wide. I think I’ll try that next," Bobo said. He went to the side of the waterfall and moved into the middle of it. He had to balance himself because the water was pushing so fast. He grabbed onto several rocks that were jutting out of the middle. "Say, this isn’t so bad. I can do this. All I have to do is hold on tightly to the rocks and pull myself up. I’m so glad. I can almost taste that thick, delicious banana now." He moved up three steps and reached for the rock in the middle of the fourth step, but it was very slippery. "Yikes!" Bobo shouted. BUMP! BOOM! BUMP! BOOM! He tumbled down the waterfall and landed in the pool at the bottom. "Cough, cough." The monkey choked and gasped for air as the water sloshed around him. He grabbed onto the root of the tree and pulled himself onto the muddy bank. Bobo was starting to get cold. "I wish the sun would come out and dry my fur," he shivered. No sooner had he said that than the clouds floated away and the sky turned brilliant blue. "Ah, there’s the sun," he smiled. He curled up in a ball and fell asleep as the sun’s gentle rays warmed and dried his fur. When he woke up he noticed something was different. Instead of a raging river going over the falls, it was merely a trickle. "It must have stopped raining up at the top of the mountains!" He was delighted. He looked up at the sky. A few gray clouds floated overheard. He looked at the banana tree. 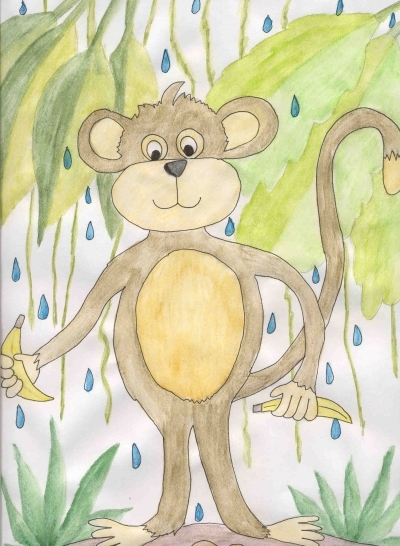 It’s thick green leaves and plump yellow bananas were calling to him. "I’ll just walk up the stone steps and get my bananas now," he laughed. Bobo jumped into the pool at the bottom and climbed up the first step. He stood there, watching the tiny stream of water trickle over his feet. "Ha ha ha. I can do this. Here I come banana tree," he called. He climbed up another step, and then another, and another. He looked up at the sky. It wasn’t blue any more. It was gray and full of clouds. He was just about to the top when he heard a roaring sound. "What’s that noise?" he wondered. Just then a wave of water came rushing over the falls. "Oh no! It must have rained again!" BUMP! BOOM! BUMP! BOOM! Bobo bumped and boomed his way all the way to the pool at the bottom of the waterfall. "Cough, cough." The monkey choked and gasped for air as the water sloshed around him.